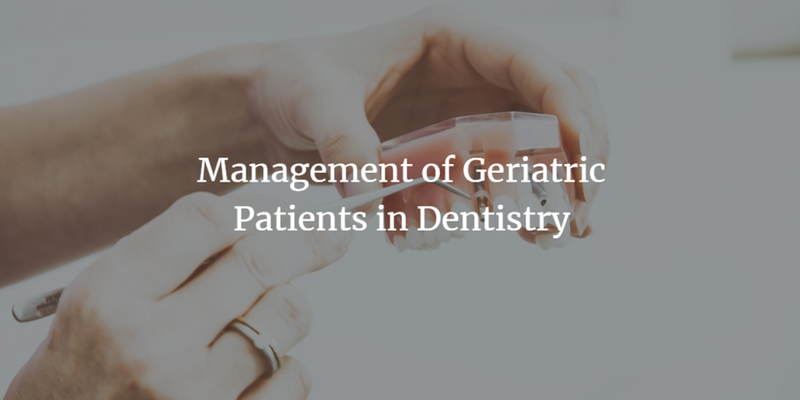 The population of geriatric adults in the U.S. is on the rise and with this growth comes a need for special considerations regarding appropriate dental care. Individuals 65 years and older are expected to represent close to 20% of the population by the year 2030. With this expansion comes an urgency to stay informed of the health challenges that come with aging and maintaining a patient’s oral health. More adults over the age of 65 have retained their natural teeth than ever before, making it crucial to provide them with the finest dental care available. Considerations when treating geriatric patients range from physical and cognitive impairment to medication concerns. Most older adults have at least one health condition that must be considered when helping them receive proper dental care. Hypertension, arthritis, heart disease, cancer and diabetes are among the most common physical ailments. Treating these conditions almost always involves the patient taking some type of medication. These prescription drugs typically lead to xerostomia, or dry mouth, making it critical to watch out for signs of this syndrome when treating a geriatric patient. They can cause cavities, a cracked tongue and lips, along with mouth sores. Since a geriatric patient’s medications commonly change, a review of their current prescriptions should be done at each visit. There are many simple and practical steps that can be taken to ensure a geriatric patient is treated properly and effectively. Since many older adults underestimate the importance of maintaining their oral health, communication is key. Many geriatric patients have some hearing loss so speaking in a clear and slow manner is encouraged. Being very thorough in explanations and demonstrating first hand how to perform tasks will aid them in their understanding. Geriatric patients with cognitive impairment are at a high risk for many diseases and infections because they’re unable to correctly maintain their oral hygiene. While they’re at their visit it’s important to: limit any distractions in the room, maintain eye contact, smile, and speak in short direct sentences. Some geriatric patients may have dementia so not only educating the patient is important, but also their caregiver. Vision loss may be present as well, which is why putting out large print magazines in the waiting room or on any prescription bottles may make the patient feel more comfortable. Not having the office lighting too dim is also recommended. Geriatric patients who have experienced hearing loss should be spoken to in a loud, clear voice that isn’t condescending. They should have a clear view of the dentist’s lips and be at the same eye level. Telling the patient before making any equipment changes and lightly touching them to gain their attention will help in communicating. Arthritis is another common condition for geriatric patients. Recommending the use of an electric toothbrush with an extra wide handle or purchasing a manual toothbrush with an easy grip handle may ease their discomfort when brushing. There’s a lot to consider when treating a geriatric patient, but being understanding and respectful will likely make the visit and the experience pleasant for everyone. If you have further questions or advice on this subject, please comment below!